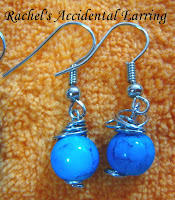 Introducing Rachel Schoen, my niece in-law, the Accidental Wire Jewelry Artist! In case, just in case you wonder about her looks, she is half Chinese and half German. This beautiful 10 yrs old is from Calgary, Canada. She is on holiday here in Kuching with her parents. They have been busy traveling here and there (in between their Kuching stay, they have traveled to Sabah, Singapore and Bali) and shall be spending the last two weeks here in Kuching before heading home next week. Look at how busy and hardworking she is with all the wire, tools and beads. She is my “first student” **smile**. She is a very fast learner I must say. I started by teaching her how to bend a simple “p” loop and she perfected it after several tries only. Bending the loop at 90° so that it will hold the beads in place, she has no problem forming the wire wrap loop. A bit loose on the wrapping but still they are unique and beautiful on their own ways. Now that she has learned how to use the tools to wrap and twist the wire, her father is quite worried about his tools at home. I would say, he should be more worried about his $$, as she will need them to buy new and more suitable tools, wire and beads. After that, there is no stopping……its addictive. Here are some pictures of Rachel's first works. 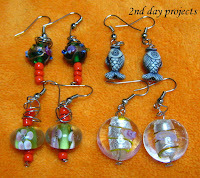 All of them are earrings and she named her first pair the "Accidental Earring". That is why I call her the "Accidental Wire Jewelry Artist". Looks like she has been bitten by the wire jewelry bug from Borneo. Labels: Earrings , z Jewelry Friends n Artists Share it! Added your blog to my freebies site as well. Thanks for droppign by my blog.